Saitama Prefecture is often viewed as the suburbs located to the north of Tokyo mainly due to a number of people commuting for work in Tokyo daily. Aside from residential areas is a popular tourist place called Kawagoe. 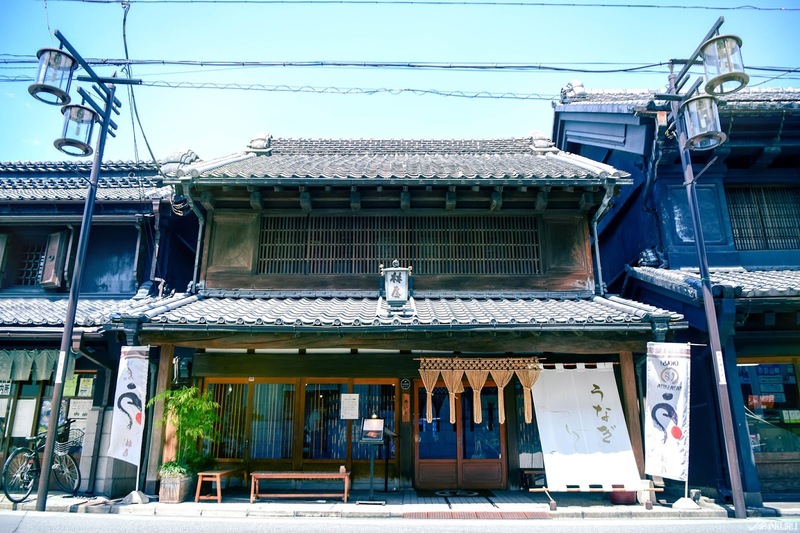 Kawagoe is also called "little Edo" since it still emphasizes the town it was during the Edo era (1603-1867). 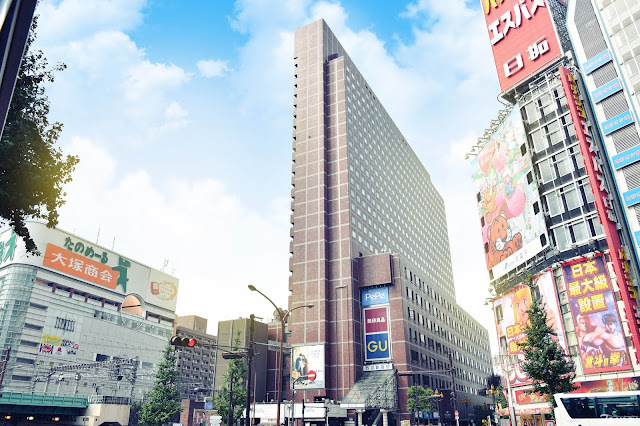 As Japan became more modern, Saitama Prefecture began to change and develop in other areas. As a result, development in Kawagoe slowed down and the buildings and old atmosphere remained to what it is today. As a result, it was reexamined as an attractive tourist place where you can feel the atmosphere of Edo meets modern society. 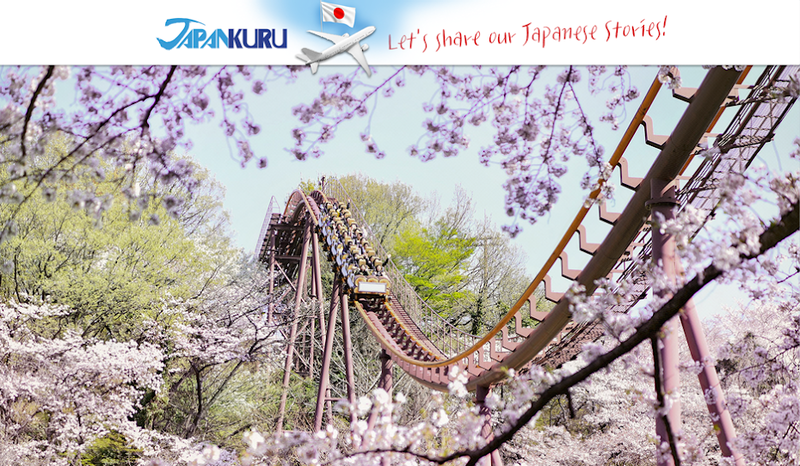 Being so close to Tokyo, JAPANKURU has visited Kawagoe many times! This time we went for a special event held at Hikawa Shrine (氷川神社 ). Kanto's Biggest Festival "Kawagoe festival"
First, if you are going to the Kawagoe area we recommend taking the train to Hon-Kawagoe Station. 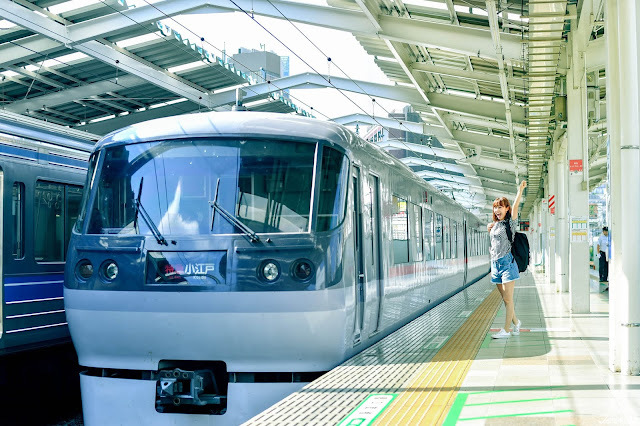 Operated by Seibu Railway, it is possible to get on the limited express train Red Arrow at Seibu Shinjuku Station and get to Kawagoe in 44 minutes! 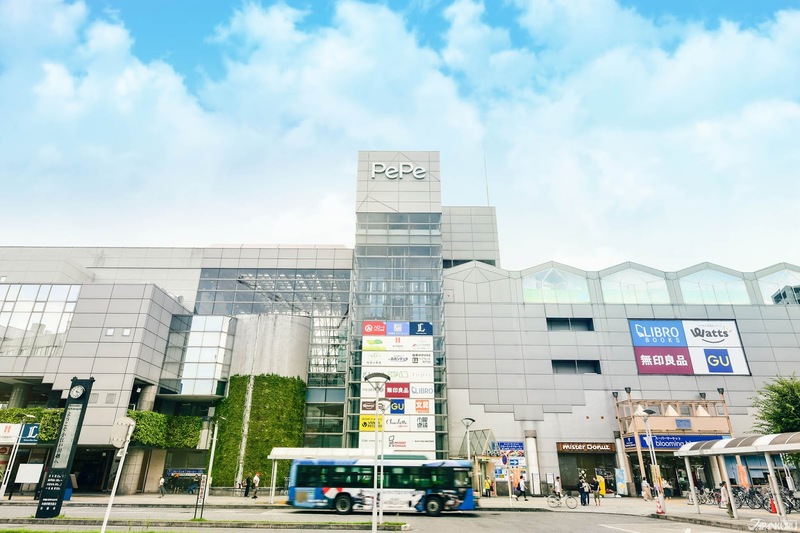 Seibu Shinjuku Station is separate from the JR Shinjuku Station but easy to spot when walking from Shinjuku Station since it is connected to Prince Hotel and shopping mall PePe. ※Different from the JR Shinjuku Station! 3. Includes vending machines and restrooms. Buying tickets are also very simple! Just go to the ticket window at the station and choose which one you would like. Once you take the Red Arrow Limited Express train, you can just sit back and relax without worrying about crowds and changing trains. Indulging in Japan's Station Lunch Boxes "Ekiben"
When a Japanese person rides a train, they normally grab an "ekiben" to eat on the train. There are many restaurants in the area, but when you are in a rush or want just a little something to eat there is an area selling station lunch boxes (ekiben;駅弁). Normally it is bad manners to eat on trains, but when riding long destinations and on certain trains like the Red Arrow Limited Express, it is fine. In fact, you will surely see many Japanese snacking on these trains! When heading to Kawagoe, we recommend the "koppe-pan" specialty shop just in front of the Seibu Shinjuku Ticket Counter, Komeda Kinsei Yawaraka Shiro-Coppe (やわらかシロコッペ). Similar to a sandwich, koppe-pan (コッペパン) is quick and easy as well as the perfect thing for when you just want something light. Also, when returning to Shinjuku from Kawagoe, you can also buy boxed lunches from the PePe shopping facility directly connected to the station. Koedo Ohana (小江戸オハナ), which specializes in eggs, is a really yummy store that we want to recommend. Most of Kawagoe's main sightseeing places start at Hon-Kawagoe Station (本川越駅), which is why many tourists start their trip from this station. Also, the simple and quick access to and from inner-city Tokyo is a big factor. 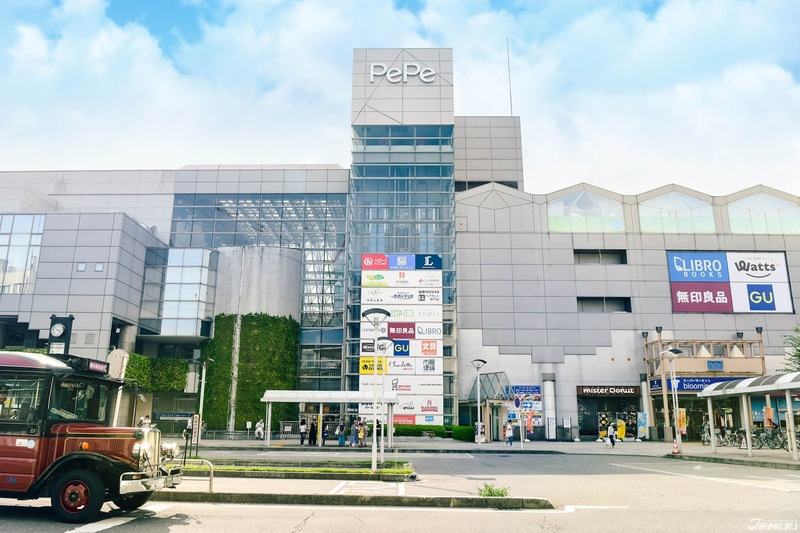 Within Hon-Kawagoe Station is also a massive shopping facility PePe that has plenty of clothing, souvenirs, and also station lunch box stores (ekiben, 駅弁). We have been to Seibu Shinjuku PePe before, but never the one in Kawagoe! 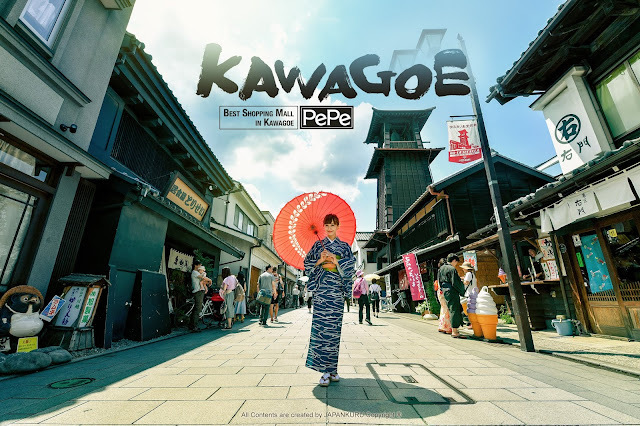 So since we arrived at this station, we took a look at Kawagoe PePe for the first time ever. 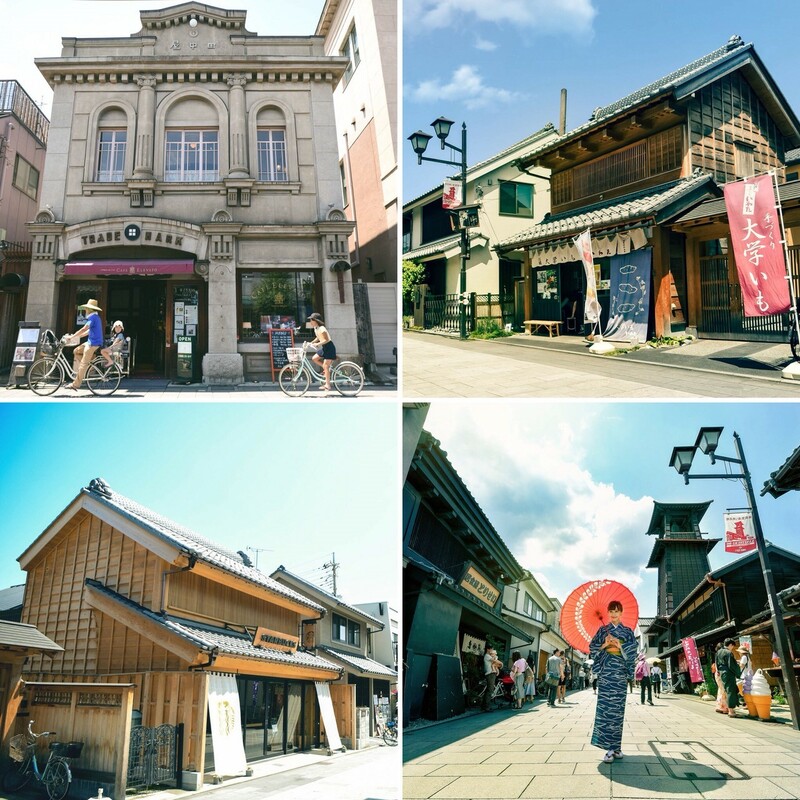 But first, we are going to introduce some sightseeing spots in the Kawagoe area. 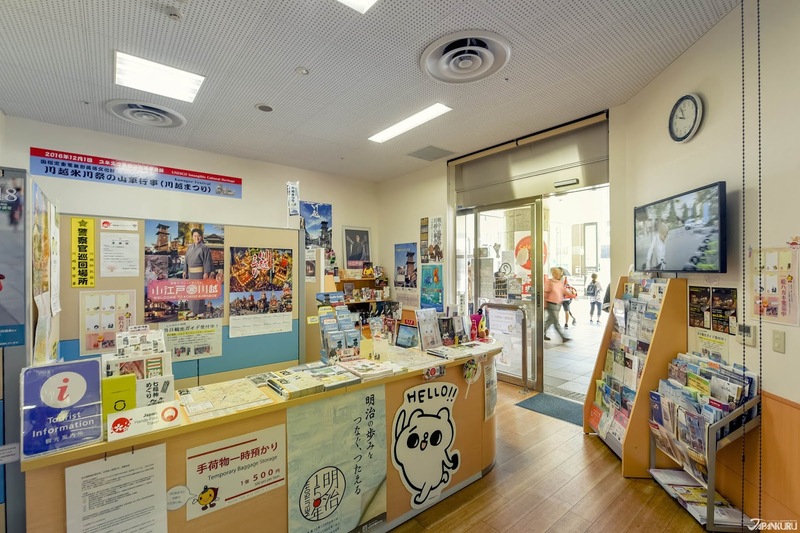 When you get off at Hon-Kawagoe Station, there is a tourist information office on the side opposite of the ticket gate. Here you can get various travel information of the Kawagoe area with brochures in multiple languages. Not only that, but they also offer a service that temporarily keeps your luggage from 9am until an hour before they close. Free WiFi is also available! Since Kawagoe has the scenery and atmosphere of the Edo period, wearing kimonos and yukatas can be a lot of fun. When we go to Kawagoe and decide we want to dress up, we normally visit the kimono rental store Vivian (美々庵). 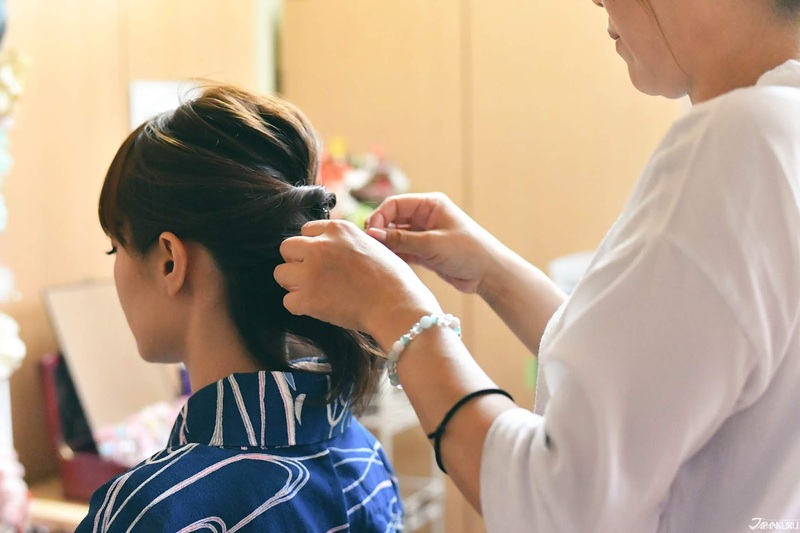 It is about 30 seconds on foot from Kawagoe's famous clock tower "Toki no Kane" and one of the firsts to start a kimono rental service in the area. If you go to Vivian, it is better to book in advance online. They are pretty low on staff, so if you do not make a reservation it is likely you will have to wait awhile. "Toki no Kane" (時の鐘), translated as the "Bell of Time", is a wooden bell tower that can be said to be the symbol of Kawagoe. Toki no Kane was originally built about 400 years ago but due to being set on fire many times it to be rebuilt 3 times. The current bell tower was built in 1893 for the 4th time and is standing among low buildings to almost show off its beauty and presence. 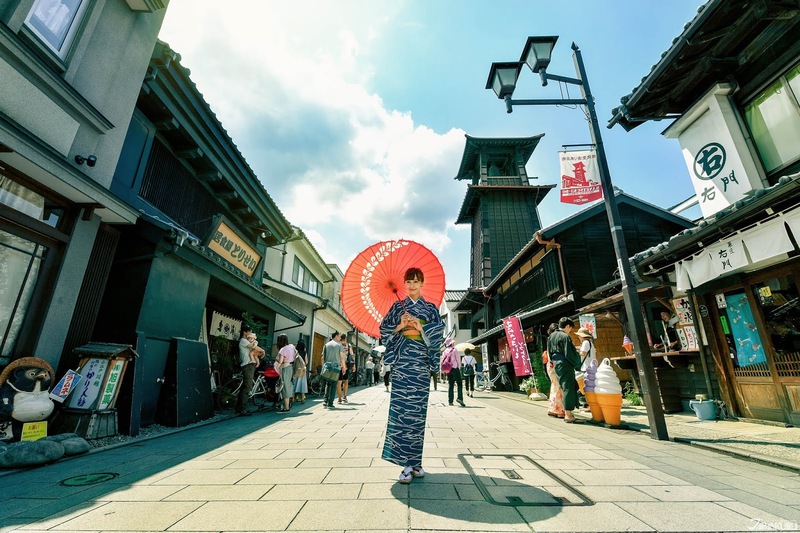 Due to being known as Kawagoe's symbol, it is often used as shooting places for as posters and magazines in promoting the area. A few steps down the main street from the bell tower is a Starbucks. 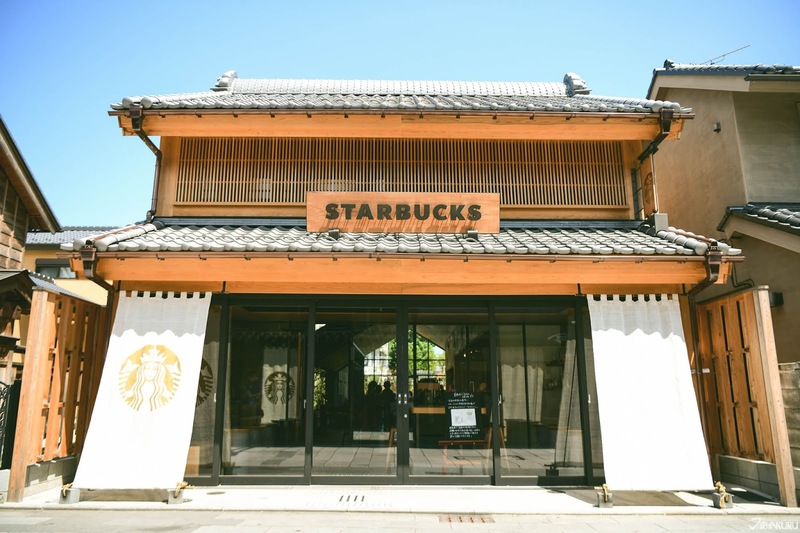 The Starbucks Coffee Kawagoe Kanetsuki Dori opened around March 2018, and its wooden exterior caught our eye. This wooden Starbucks also has a Japanese garden terrace is an essential place to stop at while in Kawagoe. If you are going to visit Kawagoe, you have to eat at the unagi (eel) restaurant Hayashiya (林屋)! 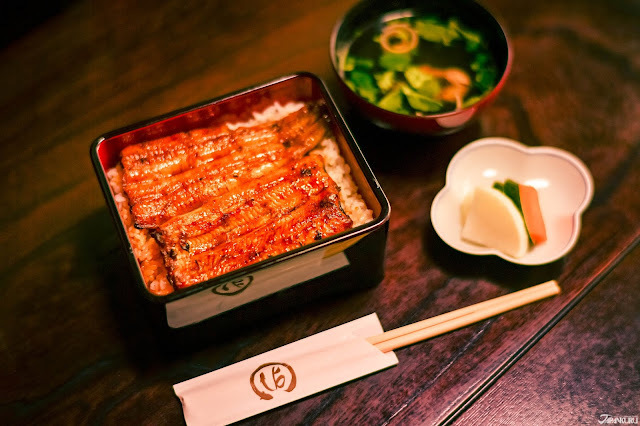 Eel in Japan is well known for being something you eat primarily in the summer. It is characterized by being repeatably baking while the special sauce soaks in making it super delicious and juicy. Since Kawagoe is the 2nd most famous place when it comes to eel in Japan, there are several shops where you can eat eel. However this particular restaurant is gaining popularity due to its sauce that is sweet and fragrant along with the eels being huge. By the way, if you go for lunch time, we recommend visiting a little earlier before the doors open since it is a popular store within Kawagoe so there may be a line. Kawagoe Hikawa Shrine is a shrine with a history of about 1,500 years and is a popular shrine especially among young people. The reason is that this is shrine enshrine the God of the marriage. For that reason, there are many charms for both singles wishing to find someone and people in relationships hoping for another successful year together. Since the shrine is a place where Gods are gathered, when entering the shrine "cleansing and purifying" the body and soal is a must. 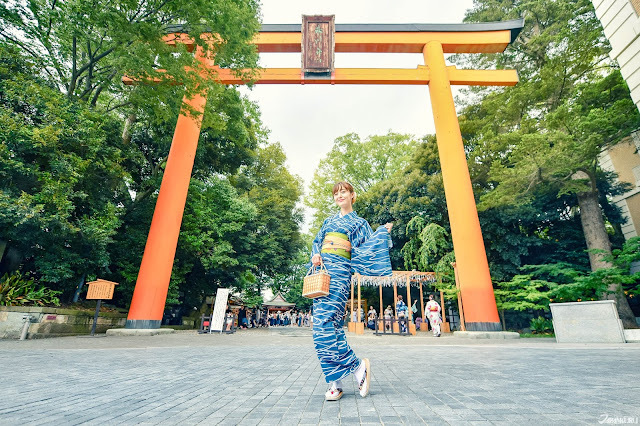 If you have never seen it or had it explained to you before, it can be hard to know the proper cleansing process which is why we are going to break it down so that you can do it properly on your visit to not only Hikawa Shrine but other shrines throughout Japan. 1. After bowing, hold the ladle with your right hand and scoop some water. 2. Wash your left hand first, then switch hands and wash your right. pour some water in the palm of your left hand and lightly rinse your mouth. Don't swallow! Spit out the water below. rinse the ladle so that water flows down the rail of the ladle. 5. Return the ladle gently, facing downwards to the original position. An ema (絵馬) are small wooden plaques at shrines where people write their wishes on. If you have been to a shrine in Japan you are sure to have seen a long wall or display of them. 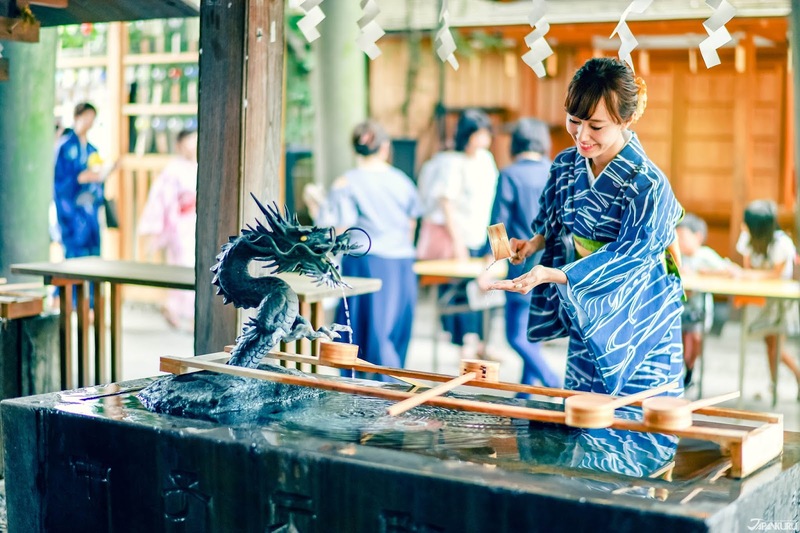 They are a really neat part of Japanese culture and definitely something to try at least once. Kawagoe Hikawa Shrine has an ema like a tunnel and this mysterious and cute scene is also one of the most popular photo spots in the shrine. Wind chimes symbolize the summer of Japan and are mostly made from glass. 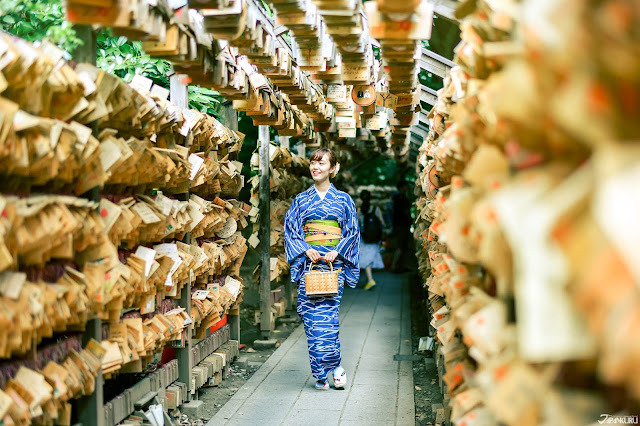 To help represent summer, Hikawa Shrine hangs about 2,000 wind chimes every year for a limited time and it is a beautiful sight. 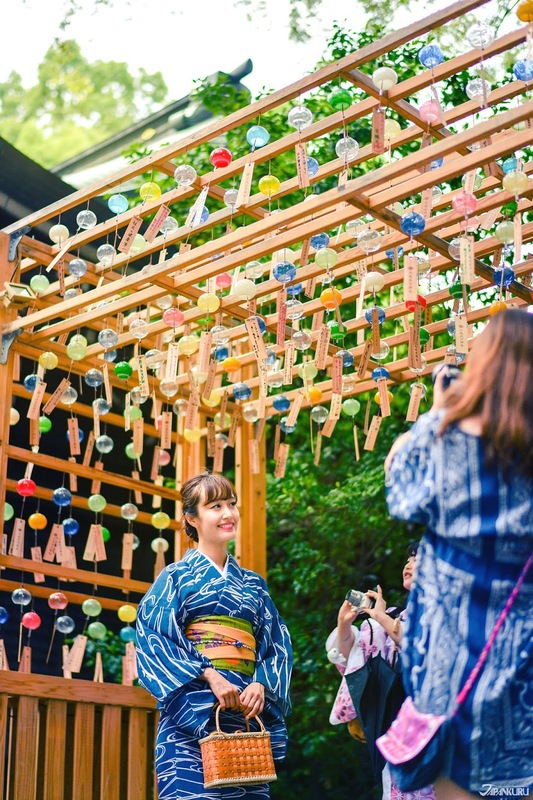 What makes these wind chimes special is that people's wishes are written on the tails of the glass wind chimes, making a unique infusion of two different sides of Japanese culture. Once it gets darker, a special light up event incorporating the wind chimes is held. In some old documents that describe the history of Kawagoe Hikawa Shrine, there is a "Legend of the Glowing River". About 500 thousand years ago, the bottom of Saitama's Iruma River glowed over a wide range every night. After noticing that, people began to wonder where the origin of light came from so the traced the source to where Kawagoe Hikawa Shrine is currently standing. At the time thought there was nothing there, so after discovering such a beautiful rarity, it was decided to build the Kawagoe Hikawa Shrine was built there. Following this honor, while the wind chime festival is being held, every day from 7～9pm, the creek inside the shrine will light up. we took a look around the regional shopping mall PePe.